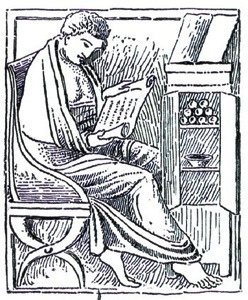 The Ten Basic Rules for Reading Latin by Dexter Hoyos will transform how you approach reading Latin. Rather than trying to find the “hidden English” in Latin, these rules will help you read Latin as the original authors intended -- in the actual Latin word order. Professor Hoyos demonstrates that the Romans were entirely logical in how they composed their writing and that it is possible to train yourself to read in Latin word order by understanding how they grouped words. Professor Hoyos has kindly provided the rules in a convenient Adobe Acrobat Reader PDF file, as a free download. The complete manual, Latin: How to Read It Fluently, which describes methods that will assist the reader of Latin prose to read it fluently at sight and comprehend it clearly, is available from the Classical Association of New England resource catalog. Ginny Lindzey has created an attractive poster and handy bookmarks -- also as free downloads -- with the 10 rules so you can always have them nearby when you are reading.